One of the many sectors of Valle de Los Condores. Photo: Felipe Luisi. When I first went to Valle de los Cóndores last year I felt like some 15-year old stoner learning about relativity and time dilation for the first time. To be fair, I had the same reaction in Cochamó, and I imagine I will again in many of the places I want to visit in the future. So perhaps that’s not so significant of a statement. But in its own way, Cóndores is immediately, and obviously special. In one gaze I could see so many beautiful, accessible lines that I knew it would take months or years of climbing here to do the place justice. What’s especially striking to me about Cóndores is how so many factors come together to make the place seem designed by God (or whatever) for climbers. First of all, there’s the access. 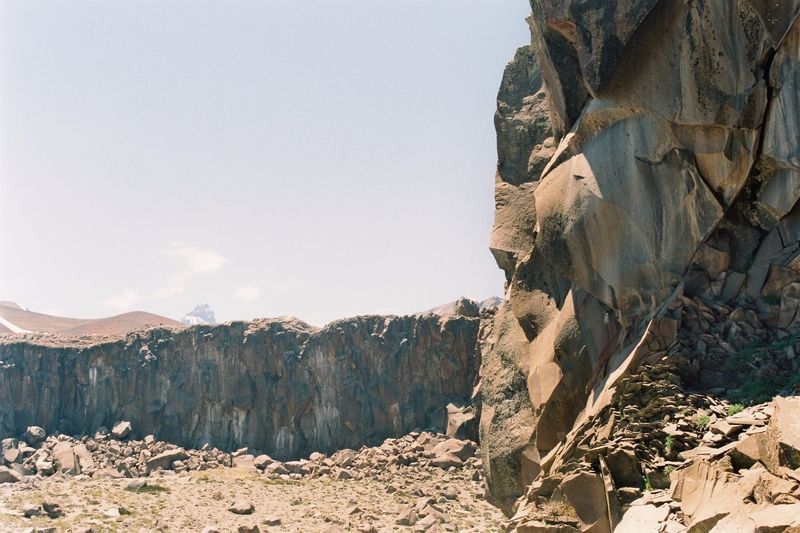 The Gran Pared (Large Wall), where the first lines were bolted in 2008, is about 100 meters off a border-crossing road between Chile and Argentina. Because of Chilean law regarding the maintenance of border crossing roads, the drive is 134 kilometers of perfectly paved, regularly cleaned curves up a sparsely populated Andean valley. It’s the kind of road that, to me, could morally justify owning a Lamborghini. 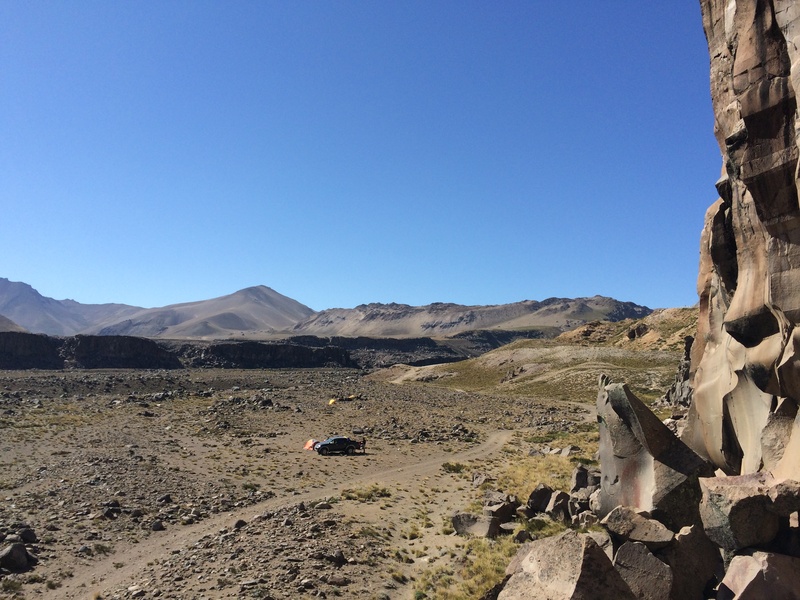 Cóndores is not just easy to get to, it’s also an amazingly pleasant place to camp. People camp on the flat directly in front of the Gran Pared, which has a creek of potable water running right by it. 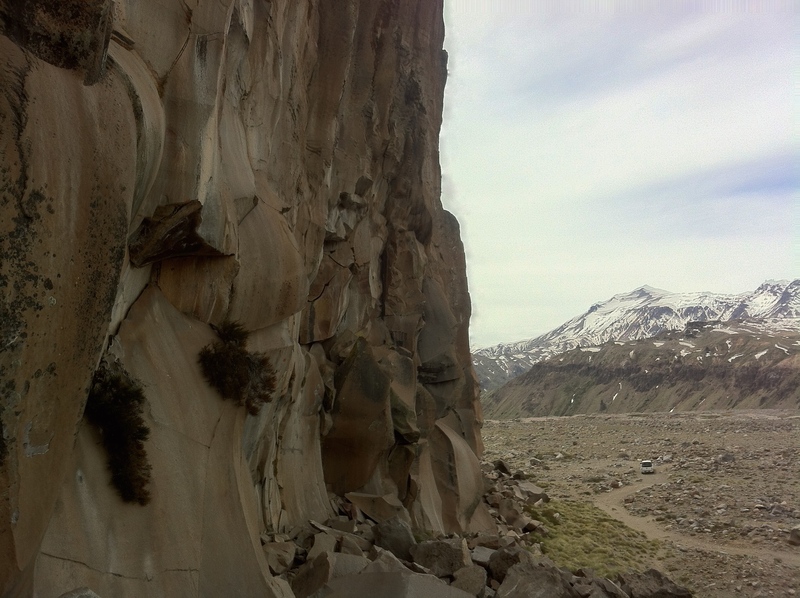 The terrain creates a totally exposed space where everyone sees the first climber on the wall during breakfast. In many cases the flat ground goes straight up to the wall and produces the spatial sensation of a climbing gym. 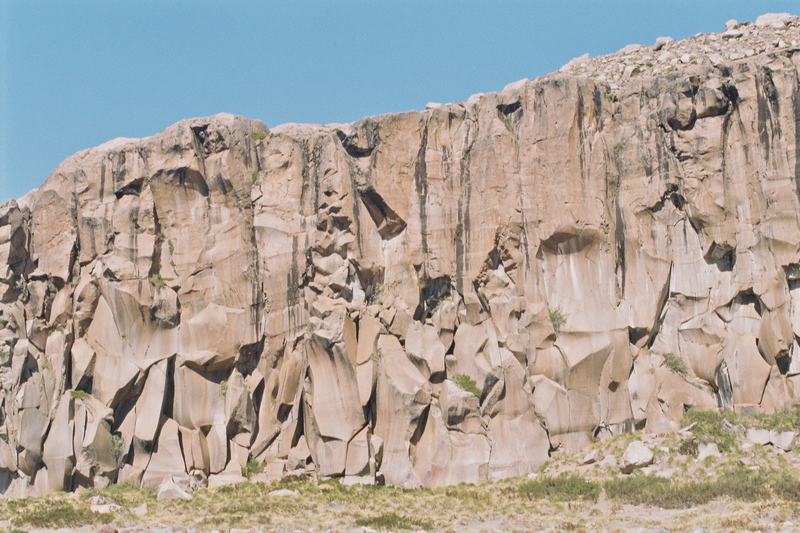 Valle de Los Cóndores consists of a series of flat plateaus with desert-like surfaces that fall off into cliffs of Basaltic granite. Photo: Felipe Luisi. The most important trait of Valle de los Cóndores as a climbing destination is probably the quality of the rock. A close second, however, is the proximity and accessibility of all of the routes. Cóndores has 13 or so equipped walls, which are all within a two-kilometer radius. The hikes are effortless and beautiful. The rock is extremely solid basalt that I can only describe as surrealistic. The lines, forms, holds, and walls can be so dramatic, angular, and sculpted that they make the crag look like a state of the art climbing gym from the future. 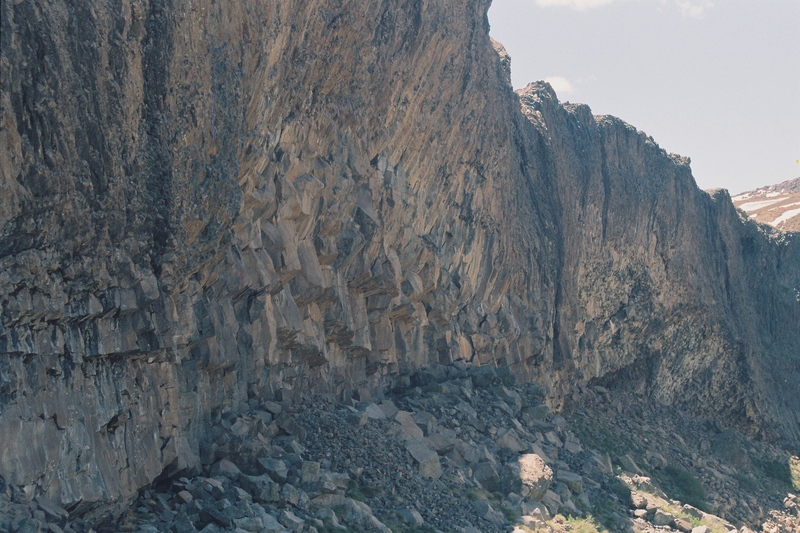 There’s so much variation and there are so many routes that you can find tons of different climbing styles, but the most notable one is what locals call “position”. It’s hard to describe, and I feel like these words could be applied to any climbing area, but something about Cóndores climbing regularly puts your body into strange positions. There are lots of curvy, slick sections of rock on routes in Cóndores, which force climbers to only use the obvious features. Newcomers always comment on how it takes them time to get used to the style. The routes are just fun as hell. 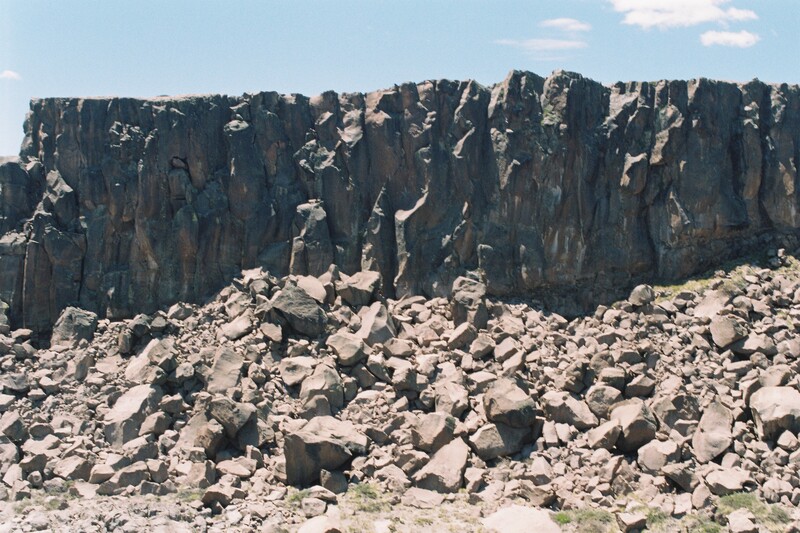 There are Kilometers of 30-meter high walls like this, as well as plenty of good looking boulders. Photo: Felipe Luisi. A closer look at one of the crags. Photo: Felipe Luisi. In 2012 there was an equip-a-thon where the number of routes ballooned from twenty to two hundred and something, so the history of climbing in the area is just beginning. For the moment, much of Cóndores is on public land and has no regulation or organization. No ordained campsites and no trails. There is a massive hydroelectric project being built in the valley, and the engineers decided that right next to the camping area was the perfect spot to store dynamite, so they came in and cleared a large piece of land, put up barbed wire fences and have left some storage containers there. I could write 1000 words on the project, but for the sake of brevity I’ll just say that it’s an eyesore. From what I gather, however, the dynamite storage will be gone when the project is finished in four years, and none of what’s being built will be visible from the climbing areas. Large sections of wall like this still only have a handful of routes on them. There’s potential for hundreds of new lines. Photo: Felipe Luisi. The current of climbing tourism in the Southern Cone generally flows straight to Patagonia, which is perfectly understandable. Yet although Patagonia is a magical wonderland of beauty and peace, the weather often blows. Cóndores is in wine country (albeit at 2200 meters) so the temperatures are nice and it rarely rains between late October and late April. A lot of travelling climbers I’ve met in the South either have never heard of Cóndores or say that it’s their backup in case they get rained out. That makes a lot of sense. Echoing the sentiment of this blog’s owner, Cochamó is my favorite place on the planet. But Cóndores is a close second, and so when I hear people relegating it to backup status it sounds a bit absurd, regardless of logistical pragmatism. I’m pretty sure it’s just a matter of time before Valle de los Cóndores is renowned as a must-visit Southern Cone climbing destination along with the likes of Cochamó, Piedra Parada, and Frey. If you’re planning a South America trip, I definitely recommend that you allot two weeks to a month in Cóndores. You won’t be disappointed. Thank you so much, Felipe for your excellent article and pictures! Felipe is also a very talented videographer and made an excellent video of Cóndores using a drone camera. You can see that video below. You can follow along on Felipe’s adventures on his instagram account: @felipeluisi. There is another excellent video of climbing in Cóndores to be seen at his vimeo account here, and hopefully many more videos in the future!